New listings, especially in a tight real estate market, get a lot of attention when they first become available. Showings start happening immediately, buyers are excited. This is the time to make a good first impression with a right price and a quick sale. The right price may actually attract multiple offers, driving the price up FOR you. If your property is overpriced, other listings look like a better deal. If your property is overpriced, it may not attract offers or second showings. If your property sits on the market with inactivity, eventually a price reduction should be in order. Bottom line: Proper pricing as a new listing is crucial, EVEN IN A HOT MARKET. You have got to take advantage of the initial marketing momentum. 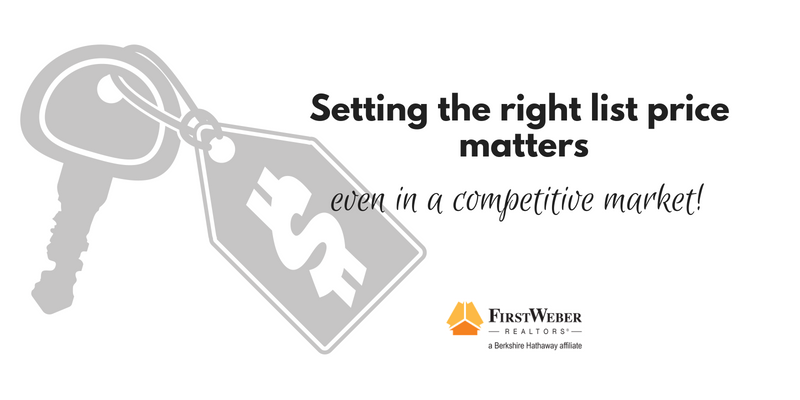 Talk to a First Weber agent in your area and go over recent comparable sales for properties like yours. Set your price with a sale in mind! Take a look at your competition for sale at firstweber.com and you can see sold property data as well.